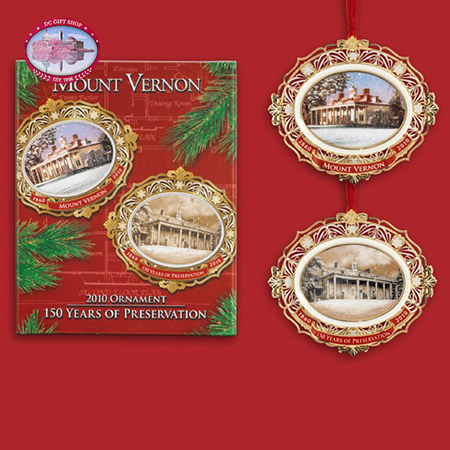 Mount Vernon's 2010 holiday ornament honors the 150th anniversary of the rescue of George Washington's historic home and the birth of the American historic preservation movement. On a quiet evening in 1853 with a full moon shining, Louisa Dalton Bird Cunningham saw George Washington's once majestic Mansion in a state of complete decay and disrepair. She hastily wrote to her daughter concerning its crumbling condition and set Ann Pamela Cunningham on course for a remarkable journey to save Mount Vernon. Miss Cunningham called upon the support of ladies of the South, and eventually the rest of the nation, through letters published in a number of newspapers. Women took up the cause and began making contributions and the Mount Vernon Ladies' Association was born. For 150 years, the Mount Vernon Ladies' Association has stood at the forefront of the field of historic preservation, safeguarding the nation's most-visited and iconic historic home. One side of the ornament shows Mount Vernon's decaying and dilapidated east front as it looked in 1860 with the words "1860 - 150 Years of Preservation 2010". The reverse side features the beautifully restored Mansion as it appears today, with the words "1860 Mount Vernon 2010". The Mansion images are on porcelain ovals surrounded by filigreed framing. The ornament is approximately 3 �" wide and 2 �" tall. 24kt gold finish. Beautifully gift boxed with an educational enclosure card.